These are some of the best emoji apps available for Android, iOS and Windows platforms. These apps help you visually express your emotions. Emojis make a source of fun talk with your friends. You can download emoji apps apk from various app stores for your iPhone and Android or Windows based phones. Emojis are the icons with the smiley faces, winking eyes etc. that we use in text messages, emails and social media. Emojis are everywhere these days because they increase the precision and nuance of our often brief communications. Sometimes a picture is worth a thousand words. Emojis help us to add tone and clarity to our communication. Emojis can be used in a number of ways but the most common ones are to lighten the mood, to soften a blow or when you run out of words. Technically Emoji is a standardized set of characters that is available on iOS, Android, Windows and OS X. While the artwork for each Emoji character varies by platform, the meaning of each emoji symbol remains the same. The appearance of each Emoji character varies by platform, as the artwork is specific to which fonts are included on the system. Sometimes we are too confused to select the apps that have the most amazing Emojis for your texting needs. In this article we will list out some of the most popular Emoji apps along with details of each. KeyMoji is a free app available on the App Store and compatible with iOS 8.0 or Higher (so, you can use it in iPhone and iPad). It helps you find the proper Emoji for a word, phrase or sentence. It has a predictive auto-complete bar at the top that suggests Emoji or Emoji combos for the words that you are typing. For example, if you type “smile” and choose an Emoji from the horizontal bar, the word typed gets replaced with the selected smiling Emoji. If you think you lack “Emoji awareness”, KeyMoji is for you as you can always find the right Emoji by typing the name. For example if you are looking for Emojis related to “holiday” or “vacation”, type the word and you get a number of related Emoji to choose from. You can also tap the palette icon to access KeyMoji’s collection of Emoji art, sorted into categories for ease of selection. Don’t know the right word for an Emoji? It’s simple, tap and hold the palette icon to open the basic Emoji keyboard and browse for an Emoji. You can disable the keyboard’s Full Access requirement but KeyMoji continues to remain functional. A same-named app from Webieez Pte Ltd is supported on Android 4.1 and higher with almost the same features. Download KeyMoji for Android. The SwiftKey Keyboard is simply awesome and has a dedicated inbuilt plug-in for Emoji. It is smart and suggests Emoji for you when you type a word or phrase. For example, typing “Lets go hiking” will automatically suggest the “walking man” Emoji. 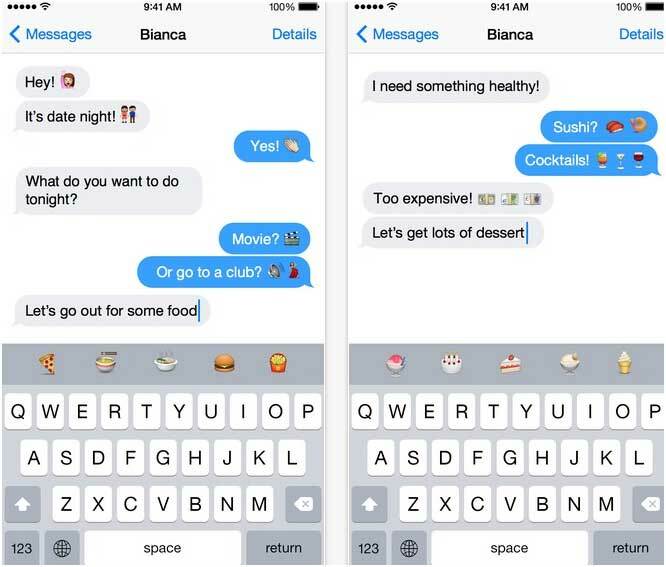 In short the app translates your words and phrases into Emojis. With hundreds of Emoji preloaded the app makes your life a cakewalk when it comes to texting messages. It is a free app available on the Play Store for Android phones and and from App Store for iPhone respectively. 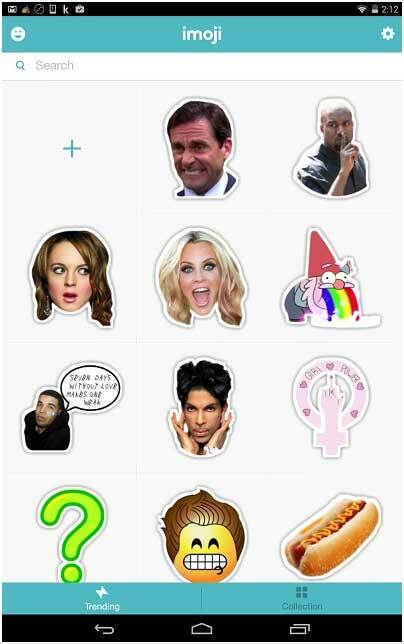 Imoji is a standalone application that provides some quirky stickers. It allows you to search for, share and discover Emoji stickers. The app allows you to create your own emoji stickers using custom pictures on your Android device. However, its major drawback is that you will only be able to send Emojis and stickers using the app’s inbuilt messenger. The app supports Android 4.0 or higher and is available for free from Play Store. This is a free app and supported on iOS 7.0 and higher. Emoji Free has a large collection of Emojis and a wide range of different types of Emojis that you can add to your texts and emails. You get the usual non-moving static Emojis, great animated Emojis, and the most wanted Emoji art where you get different pictures made out of different Emojis put together. 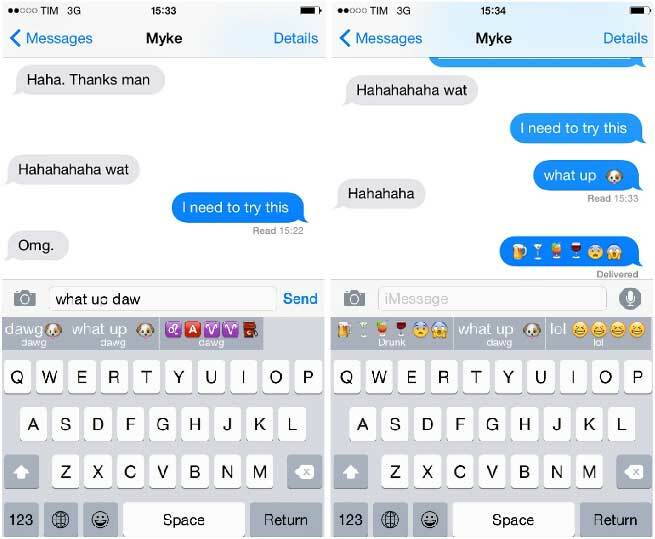 The app also features Emoji fonts that you can use to pep up your text messages. Emoji ++ puts all of your emoji in one list so you can find them instantly. The emojis in Emoji++ are apparently better organized than in the built-in iOS keyboard. 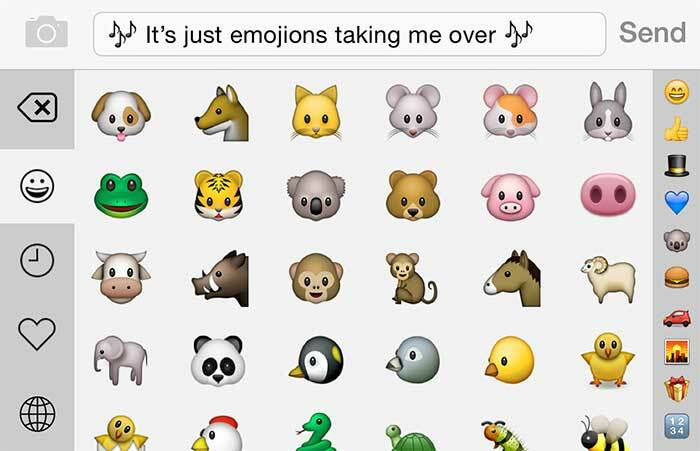 For example all the animal Emoji are found under the Koala icon. Emoji++ presents Emojis in a vertically scrollable array as opposed to a horizontally scrollable one. Also, on the left edge of Emoji++ are icons to access the recently used and favorite Emoji. Simply tap and hold an Emoji to mark it favorite. On the right edge are little Emoji to help you jump quickly to different Emoji themes. The Emoji CoolSymbols Keyboard includes over 3000 Emoji, emoticons, smiley, sticker and text faces that can be added conveniently in a message, text, email and chat with social app etc. The icons are pretty eye catching. It can be considered an equivalent of Emoji Free which supports only iOS. The keyboard supports many other languages and is therefore not restricted to English speakers. Emoji CoolSymbols Keyboard is available for free from the Play Store and is supported on Android 4.4 and higher. Are you are one of those who often complain that looking for the desired Emoji takes more time than actually typing the word, phrase or sentence that the Emoji would represent? Well in that case Emoji Type is the answer to your woe as the app’s keyboard predicts the Emoji as you type in words or phrases. By predicting the Emoji for you it saves you the pain of scrolling through a vast collection of Emoji. As you type a few letters of the word associated with the Emoji that you are looking for, Emoji Type suggests possible matches at the top of the keyboard. The app is available at the App Store for $0.99 and optimized for iPhone and iPod touch running iOS 8.1 or higher. If you are fed up of typing texts — then just go to the Play Store and download SMS Rage Faces for free! The SMS Rage Faces allows you to send faces with human expressions that convey messages with true meaning. It includes over 2500 Internet memes, GIFs and icons, and is available on Play Store and the App Store respectively. Tap a word and choose from any of the Emoji suggestions, that’s Emojiyo for you. It also lets you save Emoji combos, or combinations of Emoji characters that represent certain words, phrases or sentences. The keyboard app offers a number of custom Emoji packs for different categories like food, love, play, animals, and more. You can even create your own Emoji pack with your favorite Emoji and your own Emoji combos. Emojiyo lets you drag-and-drop and arrange your favorite Emoji and Emoji combos as per your choice. The app supports iOS 7.0 or higher and available for free from the App Store. Emoji Keyboard Pro is a fully functional keyboard that allows you to customize the keyboard to suit your requirement and provides you with thousands of Emoji. It contains hundreds of themes and its Emojis are compatible with almost all the messaging applications available. When connected to the internet, you can use the keyboard to search for GIFs that you can use right from within the app for free. Besides, the above mentioned Emoji Apps, here are few more equally popular emoji apps for Android and iOS like Emojiyari, Emoji Keyboard by Line, Emojidom Smileys, Kika Emoji Keyboard, AI Type Emoji Keyboard Plugin, and Sliding Emoji Keyboard. Use them and share your experience with us. I am sure your ranking and experience will differ from mine.